This was a very productive day. Not only did I write 2,283 new words into the novel, I did some more edits on that finished short story and I submitted one of my previous novels to an agency. I also got all of my must-do chores done. I blast music while writing because it boosts my ability to create. It also wards off distractions. But sometimes when I finish a writing session and turn the music off, my ears are ringing. The Tigers are playing the Diamondbacks right now. It’s the top of the 5th. Miggy just got a good hit and tied the game, 3-3. Man on second and third, One out. Castellanos is batting. Just ate the last of the deer I shot in October. Steak. It was good. Hope I get more meat this coming fall. Not sure if I’m done for the day, but I might be. In my earlier post, I told you I was using the stopwatch on my phone to time how long it takes me to get each page down and that I was trying to beat the previous times. In that post I told you that the latest time was 00:19:30:02 and that was for one whole page. Since then I got down three more pages. Here’s the times. I successfully beat the previous time every time. Each of these were full pages. I would say the writing quality is fair, but probably will be cutting out a bit when I go over the finished rough draft and there are many typos. But the story is getting down and that’s the important thing at this point. I would like to get it down to ten minutes per page, so I’m still striving for more speed. But that 13 minutes and 37 seconds time is a new record for me. Also, I need to take shorter breaks after completing a page. In any case, today’s work was fun. Think I’ll be doing it like this for a while. It’s real sporty. Been up since 6 AM. Though I don’t normally drink coffee, I have coffee supplies in the kitchen so my brother, or anyone else, can have some when here. But to assure I stay awake this morning, I decided to make myself a cup. Since my dad recently gave me some pointers on how a cup of coffee should be made, my coffee isn’t as terrible as it used to be. I’m trying to pick up speed on the novel. I can often get a whole page down in under twenty minutes. I’ve been using the stopwatch feature on my phone to confirm that. I know that’s not bad. Any writer would be proud of that score, and I am. But. I. Need. More. Speed. I know of writers who can nail down around 2,000 words, about ten pages, in an hour. I would love to be able to get my projects done that fast. Sure, they’ll be messy rough drafts But that’s what the clean up process is for. I have a lot of projects planned and I want to get them done. So, I’m working on that. Trying to beat my old time every time. The latest time on the stopwatch is 19:30.02. That was for an entire page of exactly 266 words. Jay Lake once said, “Writing is an endurance sport.” I’m trying to build up my ability to endure high speeds like Jay did. In other news, my cousin Josh just finished medical school. That’s a huge accomplishment. If I’m understanding correctly, he’ll soon begin his practice as an orthopaedic surgeon. I might have to see him about the finger Mr. Ed tried to eat thirty years ago. I haven’t been blogging much lately. Haven’t been getting to it and don’t really have anything to say. There has been no movement in the novel since the latest update. I was stuck, couldn’t figure out how to go forward and decided to read the thing from the beginning. I have a couple more scenes to read, and then I’ll be where I left off at and can resume writing. The read from the beginning was effective. Ideas came to mind and I see how to continue for the next chapter or so. I’ve also been cleaning up a short story that I finished a couple months ago. I wrote this story really fast and made a big mess. When I write fast and sloppy, the edit process takes more time, but it’s not that difficult to do. I find that pretty much all I have to do is cut out the crap and fix typos. I don’t see much that needs to be rewritten. So, while the fast and sloppy approach will give me a lot of work when I edit the story, the story is down. I like that. The reason I had to read what I got down on the novel so far is that I was writing too slowly and forgot about things from the earlier chapters that I needed to keep the story going. I’m going to try speeding up the novel when I get back to the writing. 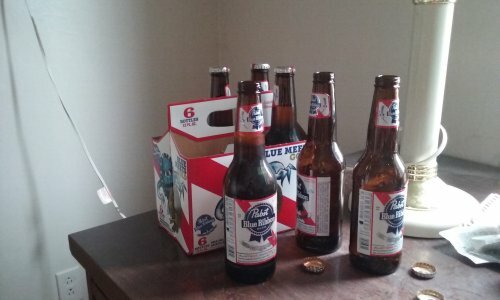 I still haven’t finished my latest novel, but I was really thirsty, so Pabst. The novel is moving all right, but not by the gallon. I’m 126 pages in and 26,367 words. I just finished off Chapter Two. The Tigers just started, so that’s what I’m going to do the rest of the evening. I got an acceptance letter the other day, for one of my short stories. The contract was agreeable. I signed it and sent it back. Payment is forthcoming. Got three pages into the novel and one into the story. So, novel, page 96 and 20,409 words. Story, page 4 and 584 words. Just finished watching the USA-Venezuela game. It’s hard to root for USA when two of my favorite MLB players are playing for Venezuela. Miguel Cabrera and Victor Martinez. But at least we have Jim Leyland and Ian Kinsler on team USA. USA got in some runs in the bottom of the 8th. The game ended with Venezuela 2 and USA 4. I got work into both projects. The novel is on page 91 and it’s 19,148 words. The short story is on page 3 and it’s 340 words. Been slow going on the projects. I’m 86 pages into the novel now and 18,072 words. I also started a new short story today. Got 134 words into that. The new short will be a contemporary political-suspense.